The title and the year of its production suggests a maritime war film glorifying the sinking of an enemy ship. 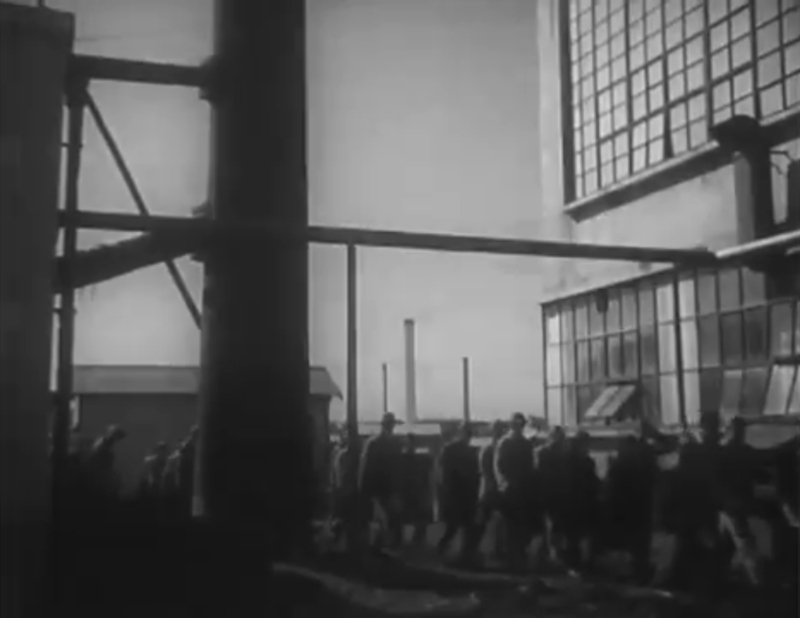 It turns out, it is a propaganda film to motivate factory workers to improve their productivity (or to work overtime). The product of the interest in the film happened to be a tornado, which (supposedly) sunk the Prince of Wales in December 1941. This reasoning is the basic tone of the message in this film. There was one weak spot in the manufacturing line, however. The Machine No.6, an old American production machine, was not ‘working well’ and had become a headache – “an accident can occur anytime” as Okawa put it. Since the United States had already embargoed Japan for some time, it was impossible to get a replacement. How about domestically-produced machines? They weren’t good enough. “The old American junk does better job than a Japanese machine.” Nobody disagreed with Okawa’s opinion, but, of course, being a propaganda film, the factory director accepted the Navy’s demand, saying “the Navy may be suggesting we should have a solution”. The actual example of a human being ‘doing less’ shows up in the character of Bami, a veteran worker in the factory. He doesn’t want to work night shifts, saying “night-shift pay is good, but I don’t have a time to spend it”. One night, he skipped his shift faking rheumatism and sneaked out to have a few drinks. Apparently he has been a habitual cheater and his boss gave him a surprise visit at Bami’s favorite bar. Instead of giving him a harsh punishment, the boss played along with Bami’s cheating. Two got drunk, but the boss had his plan in the works. He faked his own sickness, saying “that alcohol must have been methanol, oh, that place is selling a poison!” Now, Bami started feeling sick. He swore he would never drink in that place again. Back in the factory, the Production Machine No. 6 had been causing troubles to Miyahara and Okawa, and finally, its explosion and subsequent fire injured the two. Okawa’s father, a retired teacher, was so enraged that he took the next train to Tokyo to confront the Navy officer he had known. Okawa’s father asked why the Navy had issued such an improbable purchase order, and to that, Kuriyama, the Navy Captain, answered “We protect Our Lord’s country in the safe mountains, and if an enemy intrudes the peace, we will defeat them promptly”. Then, Okawa’s father succinctly threw the question, “If so, what are you doing? Our Lord’s country is being belittled in the international arena, kicked around and ridiculed by the Great Britain and the United States. They even had embargoed us. Oh, the Navy of the past had been great but now, it is sleeping! Today’s Navy officers look groom but not doing anything.” What this old man wanted is some action. Kuriyama, of course knowing that the ‘action’ would come soon, bit his lips and said nothing. Of course, the film was designed to motivate workers in weapon factories and other war-related industries in 1944. By this time, the Japanese military operations in the Pacific Theater was already in shambles, and these initial victories in the film were already the distant past. To continue the effort, however, weapons and materials needed to be supplied to the war fronts in spite of ever-decreasing resources. Probably you might recall another propaganda of this kind, “The Most Beautiful” directed by Akira Kurosawa, released three weeks after “Sinking the Unsinkable”. Because of the director’s fame, “The Most Beautiful” has drawn more interests among film fans. “Sinking the Unsinkable” is a much more confused work. There are many scenes of jingoistic speeches at an awkward moment, improbable line of events and simply an inferior writing. It feels, Masahiro Makino, whose legendary directorial career deserves more attention, was simply delivering what was ordered, and trying to forget about it. There are some moments, which must have been played around to save this film from disgrace. Makino is known for his swift and effective editing during action scenes, especially in jidaigeki, and he manipulated some scenes involving actions around and in the factory. When the workers heard about the news of the victories at the train station, they were so ecstatic that they raced back to the factory to work overtime (!). This sequence of a big mob running in the snow-covered streets was done as if it was a scene from a popular jidaigeki, “Ketto Takadanobaba“. I don’t know if Makino made it look ridiculous (it is), but its kinetic energy shows an unmistakable sign of the professional jidaigeki director. The film presents the paradox of its own. In the film, the domestic production technologies finally prevailed despite of U. S. embargo. However, the film itself severely suffers from poor quality of Japanese film technologies at the time. Kodak film stock had been preferred by many filmmakers before 1940, because of substandard quality of the domestic product. Fujifilm was the major supplier to the filmmaking industries studio at the time, but received with sighs of disapproval and lots of cursing. Uneven lighting, poor sound-recording, and lots of underexposure. Limited supply of film stocks resulted in poor acting because retakes were luxury (though Makino was known for his incredibly quick production). Maybe, Makino simply wanted to film this line by Okawa’s father: Today’s Navy officers look gloomy. Makino, a born filmmaker, loved carefree comedies and pure entertainment, and probably didn’t like gloomy, serious and twisted faces of the cultural elites at the time.